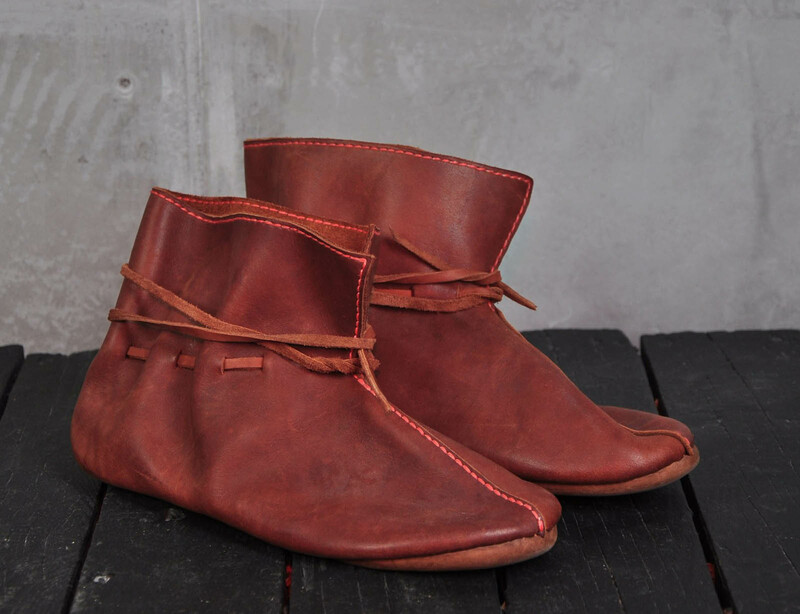 Haithabu viking shoes are the most authentic viking boots carefully recreated from the dust of the ages by our best shoemakers so that you can feel like real Vikings. This is a typical leather viking costume boots, which worn in all the territories under their control and long after the Vikings themselves stopped swimming and robbing. The Slavs used similar type boots until the XVII century. Each boot is made of just two leather pieces: the sole and the upper part. Additional leather inserts appeared if the shoemaker incorrectly cut the leather for the boot, but that is not our way, so your shoes will be completely correct. There is only way of viking boots manufacturing - hand sewing. No modern sewing machines, just needle, awl and hands of our shoemakers - historical one type of manufacturing. This viking shoes for men have a stylish and functional stitching of the leather along the upper edge, which not only predates their lifespan, but also looks very stylish. On the heel, the sole bends with a wedge, which looks very nice and significantly lengthens the life of the shoes. At the level of the ankle, boots tightened with a durable leather cord, threaded into the neat slots in the skin. Stitching along the upper edge. Rework your order at your own expense or do a full refund in case if you don’t like an item. To complete your Scandinavian costume take a look at these cool viking clothing outfit for men with viking hat or Scandinavia hat of the X-XI centuries. 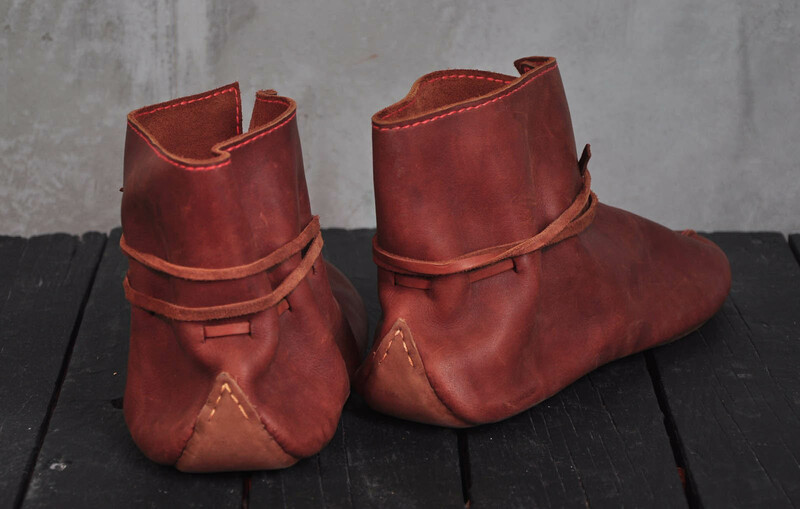 Also we offer short chausses of the XII-XII centuries to your viking boots and boots home versions: medieval wool shoes with linen lining, additional option - leather sole Viking shoes from Hedeby or wool shoes for home. In section shoes, you can see all models that we offer for ordering. If you did not find any for your taste and wish, please send us photo and description of the required model and we will make it for you. After long day in tight poulaines, it is real happiness to change them to soft and warm woolen shoes with linen lining in your tent. These shoes will wrap your feet as two small blankets. 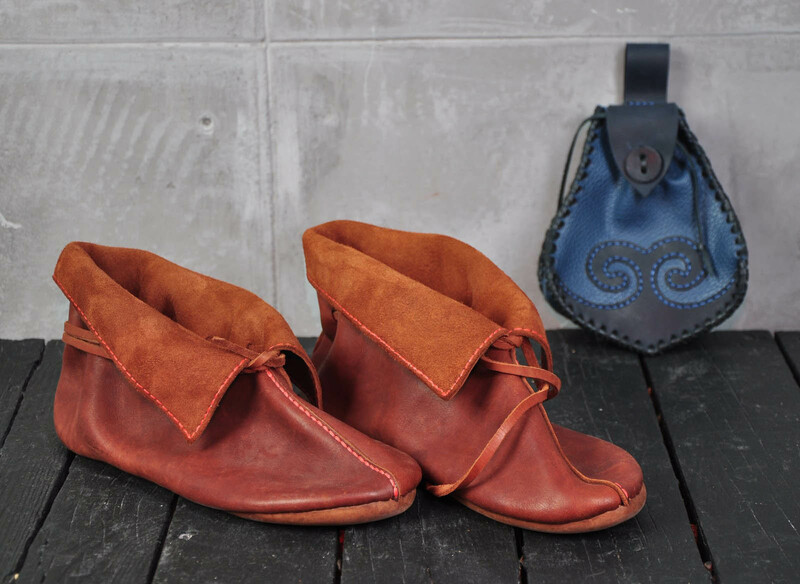 Besides, wearing these “house-shoes”, you will comfortably stay in “medieval look” even on the most demanding festival, as this model is perfect for Europe of the IX-XIV centuries. And besides, it is so nice to warm feet during cold winter evenings in such shoes. By the way, you may order soft woolen shoes of any color, matching your outfit. ..